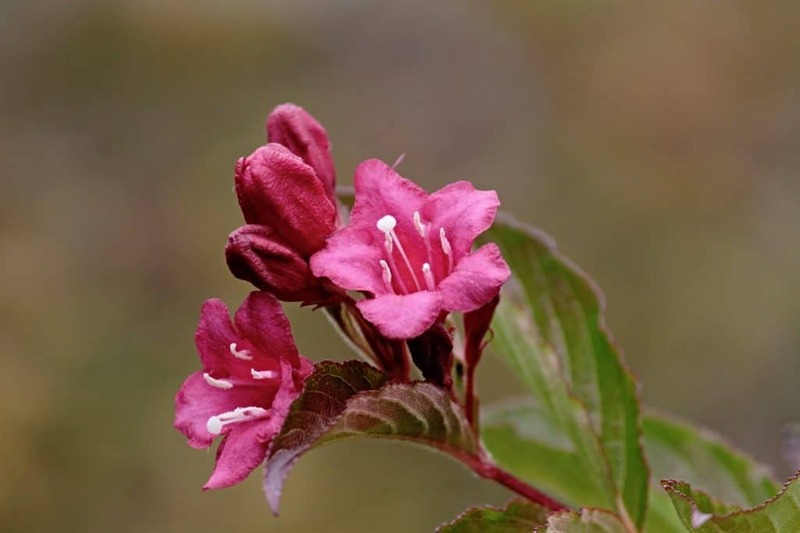 Weigela is a late spring flowering shrub that has abundant trumpet-shaped flowers. This delightful old-fashioned favourite has been enjoying something of a renaissance, as new cultivars have been developed that offer a variety of flower and leaf colours. The shades of these cultivars range from white, cream and soft pink to deep purple and crimson. Weigela makes a lovely addition to a shrubbery, mixed border or cottage style planting where it will attract butterflies and other pollinating insects. This is a hardy and easy to look after deciduous shrub and is rarely affected by pests and diseases. Read on to find how to choose, grow and care for these lovely spring flowering beauties. Any soil that is well drained. The original Weigela ‘florida’ is usually grown for its light pink flowers that smother the shrub in late spring. It reaches a height of up to 3 metres. It has plain mid-green leaves. This plant gets its name from the abundance of flowers rather than the U.S. State. There are also many cultivars that have a variety of flower and leaf colours. This dense, compact shrub has narrow oval leaves that are mid-green edged with creamy white. The funnel shaped flowers are in clusters and light pink in colour. It reaches a mature height of 1.5-2.5 metres. This unusual variety has yellow, bell shaped flowers. Its leaves are bright green on an upright, bushy shrub. It reaches 1-1.5 metres in height. This variety has rose-pink flowers that carry a light scent. The leaves are mid green, edged with white. This a more compact variety reaching a height of 90 cm after 10 years. This deciduous shrub has golden-yellow leaves, though these turn darker on shaded areas of the plant. The flowers are deep pink on the outside and pale pink within. It grows to around 1.5 metres tall. This shrub has leaves tinged with reddish-purple. It bears clusters of funnel shaped flowers that are bright pink with paler pink on the inner part. It is a smaller sized shrub reaching only half to one metre tall. This compact shrub reaches a maximum height of 1.5 metres tall. It has gorgeous narrow red trumpet shaped flowers against a backdrop of deep green leaves. Monet is a small plant that forms a low mound of around 60 cm high. This cultivar features tricoloured leaves of green, cream and pink. To make the most of this colouring and keep the variegation, the shrub should be planted in good light. The flowers are mid pink. This white variety has mid green foliage. The flowers are pure white and scented but become tinged with pink as they age. This shrub reaches an ultimate height of 1-1.5 metres. The crimson bell-shaped flowers of this cultivar contrast beautifully with the dark green foliage. It reaches a mature height of between 1.5 and 2.5 metres depending on the situation. This stunning variety has deep pink flowers that contrast wonderfully with the golden leaves. Weigela is an easy to care for shrub that will reward you with plentiful flowers in late spring and early summer. With regular pruning your plant will keep a nice shape and not become bare and straggly. Although it is not particularly susceptible to pests and diseases keep an eye on your shrub to spot potential problems early. Weigela does best in a position that gets plenty of sun or dappled shade. It will be okay in more shaded situations if it gets around 4 hours of sun per day, but the blooms may not be as abundant. Variegated leaf cultivars require more light than plain leaved varieties. The variegation may revert to plain green if this shrub is planted in shade. This is because plain green leaves can photosynthesize more effectively, so the plant reverts to the green leaves for its survival. This shrub has average water requirements. If it receives an inch of rainfall every week to ten days, it will usually be fine. In periods of dry weather, soak it thoroughly with a hose at the roots. Weigela are not fussy about soil type. They do however prefer well drained soil. You should fertilize your weigela in the spring. Use a well balanced slow-release fertiliser suitable for shrubs. Ideally, spread the fertilizer when the weather is dry to ensure it doesn’t stick to foliage. Avoid sprinkling fertiliser on the foliage of your shrub and leave 10 cm clear around the stem to avoid fertilizer burn. After fertilizing, lightly water your shrub. In addition, some extra fertilizer should be given after hard pruning. A rose fertilizer suits these plants well. 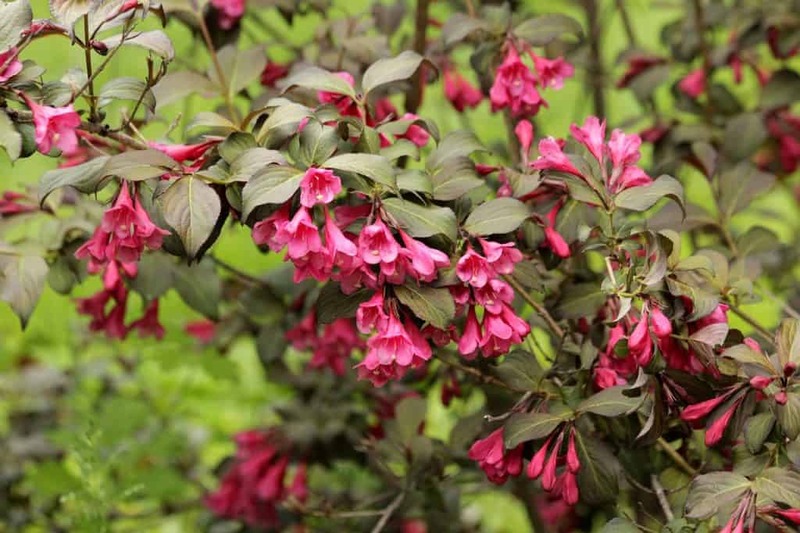 Plant you weigela any time that conditions are favourable. Avoid times when frost or drought is expected or when the soil is frozen, waterlogged or baked hard. Spring is an ideal time to plant your shrub, but it can also be done in autumn. Before planting your weigela, remove it from the pot and soak it for two hours in a large tub of water. Do not let it sit in the water for more than six hours. Dig a hole that is as deep as the rootball and loosen the soil at the bottom. The hole should be about twice as wide as the rootball. If your soil is on the poor side, then add some well-rotted manure or soil improver. Put the plant in the hole ensuring it is at the same level as it was in the pot. Carefully fill the area around the plant ensuring no air pockets are left around the roots. Lightly firm the soil and then water well. Water your shrub whenever the top couple of inches of the soil is dry until it is well established. If you have planted your shrub in spring you can also give it a dose of fertilizer now. If it was planted in autumn, then wait until the following spring before fertilizing. You can grow weigela in a container. It is best to choose one of the smaller varieties and use a soil-based compost rather than a multipurpose compost. Choose a pot a couple of inches larger than the existing rootball. Fertilise with slow release fertiliser or chicken manure pellets in spring. If you follow a good pruning and fertilizing schedule these plant with give you years of pleasure. Container grow shrubs will need regular fertilizing. In addition, it is worth scraping off the top few inches of soil and replacing it with fresh in the years that the plant does not need repotting. Your weigela should be repotted once the roots fill the pot. You can keep these plants to the size required with regular pruning. These shrubs are a wonderful addition to the garden. Plant them somewhere that their late spring blossoms can be most appreciated. You may like to choose a cultivar with interesting leaf colour to add all year-round interest to the garden. If planted in a mixed border they will need to be at the back, unless they are a very compact variety. Pruning your weigela will keep it compact and bushy and maintain plenty of flower shoots. When pruning, encourage shoots to grow in an outward direction to avoid congestion in the centre of the plant. So, prune just above a bud that is pointing in an outward direction. Weigela should be pruned immediately after flowering. This will ensure that you do not prune off the flowering stems for next year. Once your shrub has finished its main blooming you can prune it back to ensure you keep a nice dense, shrubby bush. You should cut off all shoots that have born flowers, otherwise these shoots will start to produce new wood at the ends for next year’s flowers and you will be left with straggly growth with just the husks of last year’s flowers visible. By cutting back now, you ensure that the new shoots grow from main branches and you will not be left with ugly bare twigs with flowers only at the tips. It is also wise to cut some of the mature wood back to ground level to regenerate the plant. If you wish to maintain the size of your plant, you can cut all shoots back by one third. If you have a very overgrown and straggly weigela you can hard prune it to regenerate it. Cut back all growth except any new stems that are coming from the base of the shrub. Feed it with a rose fertilizer and, although you may have less flowers in the following year, you will soon have a shrub that looks as good as new. Weigela can be propagated by seed, however the seed may not come true. To ensure you get exactly the plant you want it is best to propagate by cuttings. You can take semi-ripe cuttings in summer or hardwood cutting in winter. Always use sharp, sterilised tools to take cuttings. These should be taken in late summer to early autumn. Water the shrub the day before taking cuttings if conditions have been dry. The best time to take cuttings is early in the day. Select healthy shoots from the current season’s growth. They should be slightly woody at the base and green at the tip. Pinch out the soft green tip. Divide the cutting into sections of 10-15 cm, with the base cut made just below a leaf bud. Remove the lowest leaves from each cutting. If the remaining leaves are large these can be cut in half to reduce moisture loss. Dip the base of the cutting in rooting hormone powder which will encourage rooting as well as protecting against rotting. Insert the cuttings into containers filled with a mixture of half compost and half sand or perlite. Place the bags in a cool greenhouse or cover the bags with loose plastic bags and put them in a sheltered place that is bright but out of direct sunlight. Check the cuttings weekly, remove any dead material, give them an airing and water if necessary. Take these cuttings after leaf fall or before the new season’s growth begins. Select healthy shoots from the current year’s growth. Then cut each stem in 15-30 cm sections, ensuring that the cut is made at a slight slant above a bud at the top. Cut the base of the cutting straight below a bud. Remove the lower leaves and dip the base in rooting hormone powder. The cuttings can be grown or indoors or outdoors. If growing outdoors prepare a trench in a sheltered position and dig in some well-rotted manure or garden compost. Put a layer of sand at the base of the trench and insert the cuttings so that two thirds of the stems are below the soil surface. Alternatively, simply insert cuttings into deep containers filled with half compost and half grit and place the pots in a cold frame or cool greenhouse. Check the cuttings regularly and water them if they dry out. They should be ready to plant on by the following autumn. Weigela is not usually troubled by many pests and diseases. However, keep an eye out for the following just in case. Signs of scale infestation include weak growth and a loss of leaves on the inner stems and lower branches. The mature female insects on the stems appear as brown or black patches on the stems. They have a protective outer coating and look like a growth on the stem. The male insects appear on the leaves between May and September. Pesticides are only effective against the young insects. Once the insects have matured and are covered with their waxy coating they can be difficult to remove, though you can sometimes scape them off with a fingernail if they are not too numerous. If you use a bug spray you will need to apply it in mid-May and then at intervals after that to break the life cycle of these bugs. Avoid spraying when the plant is in flower as this can harm pollinating insects. Aphids include insects such as such as blackfly and greenfly. These can cause yellow curled leaves and eventually, if left untreated, branches may die off. Usually, these can be removed with a strong jet of water or spraying with a soap solution. A severe infestation may need treatment with an insecticide. Encouraging beneficial insects such as ladybirds and lacewings can also help keep them under control. Leaf spot disease is cause by a fungus. It appears as black or brown spots and also causes the leaves to turn yellow and become distorted. Improving air circulation reduces the likelihood of fungal diseases. If the shrub is very dense you may like to thin it out to improve air flow. Cutting back surrounding plants may also be necessary. In addition, destroying fallen leaves will help prevent the spread of the disease. The symptoms of this disease include a white, powdery coating on the leaves, especially new growth. Eventually, the leaves go brown and drop off. This disease is rarely fatal to the plant; however, it reduces the plant’s ability to photosynthesise and can weaken the plant over time. Powdery mildew usually occurs in warm and damp conditions. To prevent the problem, ensure there is adequate air circulation around your plants. This might involve cutting back surrounding plants or thinning the growth of your shrub a little. Always water at the roots rather than all over the foliage and ideally, water early in the day as this gives the leaves a chance to dry out in the sun. Avoid fertilizing your plant when it is affected as new, sappy growth is more vulnerable to infection. You could try a homemade mixture of 1 tablespoon of bicarbonate of soda and ½ teaspoon of liquid soap in a gallon of water sprayed onto the plants. There are also commercial fungicides available. Q My weigela hasn’t flowered. Why is this? If this is a new shrub it may be that it is not mature enough to flower yet. Many do not flower in the first year after they are planted, even if they were flowering when you bought them from the garden centre. This is because they often put their first year’s energy into developing a good root system. If this is the case, your plant will most likely flower well next year. The other common cause of weigelas not flowering is incorrect pruning. These shrubs should be pruned as soon as possible after flowering as they flower on old wood. If you prune them in late summer, autumn, winter or early spring you may prune off the flowering stems for this year. These shrubs usually flower in late spring and early summer. Once this flowering period is over and the flowers had dies back, it is time to prune them. Q Some of the branches of my weigela have died over winter. I though this plant was hardy so why has it been affected? While weigela is very hardy, the tips of branches are sometimes affected by severe weather, especially very cold, windy weather. However, your plant will not be seriously harmed. You can trim back the twigs that are affected once the weather warms. Q My weigela has new shoots coming the base and has flowered this year, however it has lost many of its leaves. It is in a sheltered position in full sun and clay soil. It may be that your shrub is suffering from root rot. Clay soil can sometime cause plants to sit in wet conditions, especially in a wet winter or spring. Try cutting the main part of your plant back and leaving the new shoots. However, this may not save the plant. In order to rescue it you may have to move it, improve the drainage or build a raised bed for it to live in.